JR here reporting on today’s plan! The crew is still drilling into the basalt that makes up the hard rock of the ocean floor. It takes quite a while to cut a hole in solid rock. 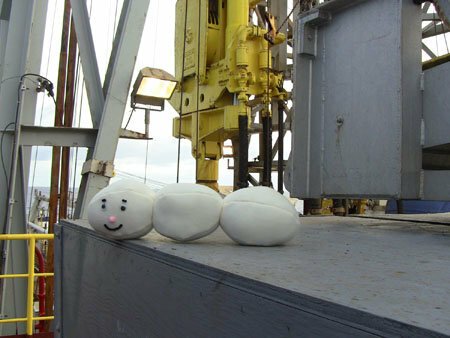 The scientists hope to bring the first sample of basalt up to the ship’s deck sometime this morning. You can see the drilling area behind me. That big yellow thing in the photo is used to pull the pipe up and down. It also is extremely heavy because it does something else also. While drilling is going on, the ship is still going up and down with the waves. This up and down motion would break the drilling pipe if it were not for the laws of physics. The large, heavy yellow piece stays still, it doesn’t move up and down (See bottom photo). That is Isaac Newton’s Law of Inertia at work. So, the drill pipe is attached to the bottom of what is called the heave compensator and it allows the ship to move up and down but the drill string stays still. The result is no broken drill pipe. It is amazing to watch because it looks like the pipe is moving but it is actually the ship. The weather is cool and breezy this morning. You can see the sunrise in the photo below.